This time of year, I begin saving those disposable containers that look like they have good gift presentation potential for fall birthdays and Christmas/New Years. Here are two sizes of containers that I recently rescued. The larger ones had some bakery stuff from Costco in them. I rescued those from our church's monthly tea. I was thinking they might make nice boxes for "spa day" kits, with hand-knit spa cloths, some hand-crafted soaps, some bath tea and maybe a spa candle. I'm thinking I could nest all of the items in a bed of shredded pastel-colored paper (great use for used wrapping paper that may look too shabby for reuse). The smaller containers are sized about right for some hand-formed truffles. Again, these might look nice nested on a bed of shredded paper. Not for gifts, but rescued nonetheless. These next two plastic containers should be good for packing lunches. The smaller one on the left is just the right size for a handful of sunflower seeds and raisins. And the one on the right is a coffee jar. Remember when those were made of glass? Well, now they're plastic, which is good and bad. The bad, plastic doesn't look as pretty for kitchen storage. The good, plastic is lightweight and non-breakable, which makes it a great item for packing someone's lunchtime salad for a backpack. As an avid coffee drinker who never bought into the Keurig equipment, I also acquire a fair number of coffee cans. 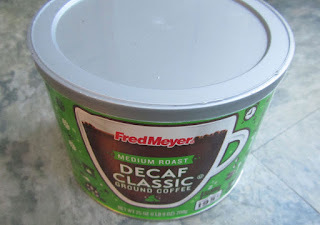 Fred Meyer's cans now have silver lids. I can see these cans decked out in white, silver and blue gift wrap, and holding a homemade batch of some snacky giftables, like Teresa's candied popcorn. And the unrelated bit . . .
After knitting several natural-colored spa cloths, my knitting life was beginning to feel like it was all too neutral. The knitting version of living in black and white. I switched over to my lavender-colored yarn, and not only did the knitting take on more beauty for my eyes, but I swear I could smell something perfumey, from time to time, while I knitted away. Funny how our brains can do that to us. Anyways, spa cloths look nice in colors, too. I love the idea of rescuing cans and boxes for gifts. I have some #10 cans I am hoping to turn into gift containers. I reuse plastic containers whenever I can. It just makes sense, doesn't it, to reuse those containers as much as possible. I'm eager to hear what you do with your #10 cans. I do get a fair number of those, too. One year I spray painted #10 cans dark blue then, spray painted the bottom 1/4 of the can white like a snow base. Next hand painted evergreen trees, a large snowman, and falling random snowflakes. I punched holes in the top side of the can and attached a white cotton rope for a handle. They were adorable containers for composition food gifts. those sound adorable. You wouldn't have a photo of them to show us how they turned out, would you? Were these cans that were opened with a can opener? If so, did you do anything to smooth out the rough/sharp edge on the opening of the top of the can? I don't have a photo, but I could very easily make another (on a smaller scale) and use it for my granddaughter this year. When I do I will be happy to share a photo. I have one of those crazy can openers that leaves no sharp edges so I reuse cans to hold gifts all the time. My can opener doesn't leave a nice edge, so I'll have to see if I can hammer down any rough bits. If you do make another, definitely share a photo!! They sound so cute! Anne, those cans sound adorable! Thanks for the idea. Such of wealth of information, right? Both Anne's cans and Teresa's popcorn sound wonderful! Thank you, Angie! I hope your day is wonderful, too! I only wish I had a place to store all the plastic containers I get. I end up recycling them instead of saving them only to wish I had saved them! I will intentionally save a few now that two kids are moving to apartments. I know they would appreciate a meal once in a while and then I'll use these containers to deliver them to the kids or they can pick them up when they come home once in a while. Reusing plastic containers for sending meals with your kids is a great use, as then your kids don't have to think about returning them, and you aren't wondering when they'll come back to your kitchen. Yeah, sometimes I am overflowing with rescued containers, and I need to do a bit of a clean-out. There's only so much one household can use. I also rescue containers now and then if they seem like something I might want to use for a gift container. It's a great way to recycle and save money at the same time. I do limit what I save though, as those can pile up, and I'm in anti-clutter mode these days. I try not to accumulate more than I will use up in a few months. I'll likely purge a bunch of these containers, just after the holidays. Otherwise my pantry gets overrun, and there's no room for the other, incidental, stuff, you know, like actual food. Good for you to be in declutter mode! I'm trying. My husband has a meeting every Wednesday afternoon that Subway cookies are bought for. He generally always brings them home. I freeze for school lunches or my staff meetings. I have a ginormous pile of subway takeout. 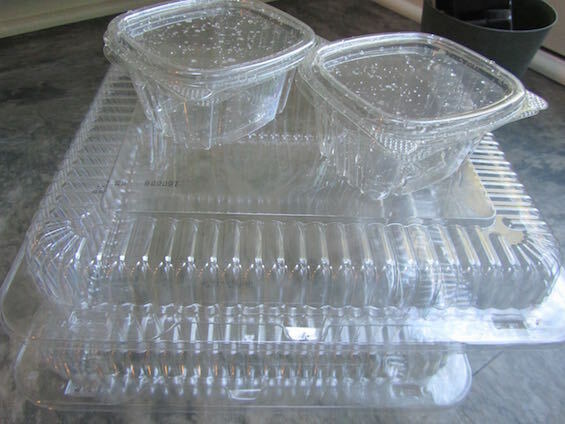 This along with the metal takeaway containers that Chinese food is sold in here are used to pack leftovers for family celebratory meals. I plan extra so everyone gets some leftovers to take home. I also have been bringing the Subway containers to a monthly meeting I go to that a couple of overseas students attend. We have gotten in the habit of "gifting" them the leftover food. I don't like the plastic but consider it a bit of extending the life of the package. The tiny sauce containers I have cleaned out for seeds from my cherry and plum trees. One of my staff brings her lunch with cut up,vegetables. The dip she puts on a muffin liner in the container. I have also used the big salad domes for putting a box of mandarin oranges in at Christmas . You can put shredded paper underneath. It's a good gift for a large group potluck or thank-you. Lili , I'm sure you have figured out all the Kohl's cash frugal " hacks" . I don't have a Kohl's, but Clark Howard has an article on today that mentions all sorts of ways to maximize Kohl's cash. 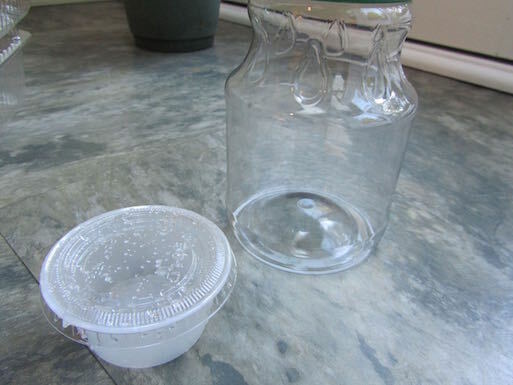 oh, some good uses for plastic containers, to get one more use from them! I love the idea of filling a large salad dome with mandarins. I'll be keeping my eyes open for large containers, for last-minute gifts of fruit bowls/baskets. And thanks for the heads up on the article on Kohl's cash. I'll check it out. My technique is to shop the clearance racks, there with my coupons. I was thinking just this morning about some of the great deals I get on those clearance racks. Ha! My "Sunday only" hazelnut coffee is stored in a vintage, glass, former Maxwell house coffee jar. It's crazy that glass jars are now "vintage". Very good use for your vintage Maxwell House jar. I like to save disposable plastic containers and find so many practical uses. I keep those clear bakery/produce containers for keeping small craft items together and organized. I started knitting another t-shirt rug, this time using a small sized needle (size 6) and a thinner strip of fabric. Seems to be working better. This business of recycling is very satisfying. It still, however, bugs me every time I see how cheap rag rugs are sold in stores, that spending several days to make one rag rug is not worth my time. Lest I forget why I like to use trash as craft material (even plarn), other than it appeals to my frugal nature, is... I wanted to hone a design and construction technique using a no cost method. Later when I have my design process figured out, I hope I can progress to wool or batik. This is a long journey, in the meantime, it sometimes feels like I'm loosing my sanity. There are some useful benefits, as now we have lots of useful "trash rugs". your new rug sounds very promising. I hope it goes well. Oh, that's too funny -- I'm sure your sanity is still intact. I'm sure you'll find your trash rugs very useful. Think of your crafting as your therapy time. You could just as easily spend $100/hour on a therapy session. I'm sure it's all calming once you get into a groove. Have a lovely day, yourself! Knitting is therapeutic and so is ripping the fabric strips. Except the fabric is of such poor quality, the strips don't always tear evenly. Even at that, I enjoy the serendipity of having different sizes and colors to work with. It would be so much easier to just buy what I need and be done with it (order online all the wool fabrics I want). But I don't feel I'm there yet. This is the frustrating part, and can be so un-therapeutic. But I know I need to trust myself that one day I'll be ready to spend money on the good stuff. It would be hard if I ended up with something I didn't like, and spent a hundred dollars and several weeks making. So it sounds like knitting with t-shirt strips is practice for someday using purchased fabrics/supplies? Wool would be nice. It doesn't matter too much whether I knit, crochet, locker hook, bead, weave, etc. I want to practice using intuition rather than sensing to guide my selection of what to use where, so for now it doesn't matter what method of construction I choose. One day, however, to get heirloom quality, I think I want to locker hook or use one of the other hook rug methods that uses wool strips or batik. But after making one locker hook rug (I crocheted the backing--too cheap to buy the backing fabric around $10-- and used t-shirt strips instead of fabric that didn't stretch like batik or wool), I was discouraged, construction took forever, and the result not as I expected. Knitting is faster, and I still get to practice my particular design process, and is better suited for tshirt strips than using the locker hooking method. I've been obsessed with an intuitive approach to "making" for a very long time, since college. I may never understand what all this fuss is about, since I still struggle with each piece especially how to conclude and bring all the elements together in a pleasing way. Maybe that is as good as it gets, but I still think I'm missing a step in the process. I'll have to start looking at my rescued containers with an eye toward gift giving. Usually I only think of cookies. However, this will have to wait. I'm not collecting anything now with a move on the horizon. Got it! You are too busy purging to possibly add to your "stuff". Good luck with all of this. So much happening, so fast. I'm sure it seems surreal at times. Good idea. I am using the small sauce containers for. Decoration for hand crafted baking mixes. For some gifts back to the kindle please excuse typos. Laptop refuses to go online. that's a great use for the sauce containers. At least you can still read, online. I hope your laptop will begin behaving, soon! What yarn did you use for your spa cloths? Some Sugar and Cream yarn is scented. Perhaps you have the scented variety. I had seen the "scents" yarn, so I checked my balls. And they're just regular yarn. I think my mind was just playing tricks on me. 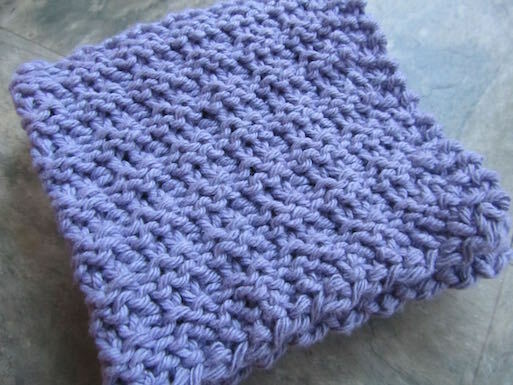 I was thinking about making soap, making bubble bath or bath oil while knitting, and my mind just put two things together. Crazy! Great idea on the large clear plastic container for your spa package. I think it will be a beautifully presented gift! I knit up a winter themed pillow for my sister for her birthday and hunted all over the house and garage for a box appropriately sized to mail it in. I ended up taking the Sam's Club sized box of Veggie Straws and removing the packages into a large Sam's size box of Vinegar and then put the pillow inside the Veggie Straws box. I did have to squish it down a little but it worked! I did not want to have to buy a box plus filler material. I filled in around the box with leftover plastic grocery bags as well. I have not seen the scented yarn! How fun. Does the scent last long after washing I wonder? Good job on the boxing up of the gift, KCMama! I have no idea on the scented yarn. I wonder, too?